Brighten up and reveal your vivid alter ego in the midst of the dreary winter months with the latest trend – NEON NAILS. With fingerless gloves a must-have this season and nail art lining the pages of blogs and forums internationally, it’s effortless to make your best accessory colour-popping nails with Illamasqua. Our colour-intense, chip resistant Nail Varnishes provide a broad range of bold, rich and vibrant colours that are sure to make you stand out from the crowd. To get a little more insight into this winter’s boldest trend, we caught up with Illamasqua’s Director of Product Development, David Horne, to give some tips on why neon is so hot right now, creative ways to ease into such bold colours, and the top shades from Illamasqua to try. Q) Why have neon nail colours been a recurring trend not just for spring but for winter too? A) People are feeling a sense of conviction in regards to treating nail colours as statement accessories – this has been driven by Japanese street trend and influencers such as Lady Gaga through the music evolution. Q) If you normally shy away from bright colours what is the best way to ease into the neon trend? A) Neon tips are a great way to be experimental with the neons without full manicure commitment or try alternate shades on different fingers so the effect is more playful. 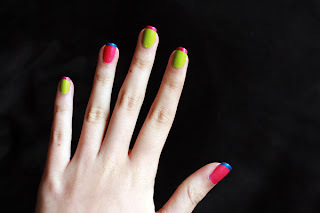 Q) Is the neon nail trend strictly for night time/going out or can you wear the trend during the day? A) Neon is a statement whatever the time of day and signals a fun personality trait and bold self expression. Q) What are your top 3 Illamasqua neon Nail Varnishes? A) Nail Varnish in Collide, Nail Varnish in Rare and Nail Varnish in Gamma.